JAPANESE NAVY " Mitsubishi A5M4 Type 96 Carrier Fighter "
The model is built from testshot. #14134 Mitsubishi A5M4 Type 96 Carrier Fighter, Finely molded parts; 0.3 mm thin clear canopy parts. Type 96 carrier-based fighter was a Japanese carrier-based fighter aircraft. 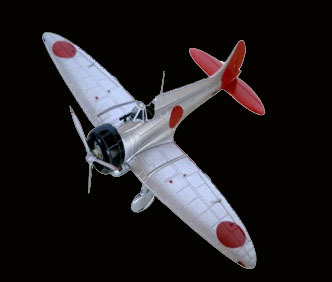 It was the world's first monoplane shipboard fighter and the direct predecessor of the famous Mitsubishi A6M 'Zero'. The Allied code name was Claude. 2 complete aircraft kits in a box. Molded in Greenish light gray. Recessed panel lines and rivets. High quality decal, printed by CARTOGRAF in Italy includes Four Aircraft Markings. Three aircraft are from CHITOSE Flying Group Fighter Squadron in HOKKAIDO Japan from late 1940 to mid 1941. Two wear HOUKOKU (donation) markings. And one is stationed at Rabaul East Field in early 1942. All the fine panel lines and rivets are exquisitly engraved. All parts are clean and sharply molded as Sweet Model Kit Standard. Type 96 Carrier Fighter's natural metal surface was coated with clear dope against damage from saltwater. The clear dope gradually added yellow tint. It's said that veteran "Claude" wore golden sheen. You can simulate this effect on your model too. HOUKOKU markings (donor's name) are printed in fuselage band.